I have two toddlers, which means I have two car seats in my van...soon to be 3! :) When installing car seats I am sure you are all aware of the safety and care it takes to make sure that they are properly installed. I always make sure that I push the car seat down into the van seat to make sure it is tight (sometimes I press my knee into the seat to make sure it is in as far as possible). This puts the seat securely in place so it does not move. When it comes time to move the car seats around to a different seat in the car or into a different vehicle, I am always SO embarrassed to see the huge mess that is around the base of the seats. Not to mention the horrible indentation that the "feet" of the car seats leave from being in so tight. With spring cleaning and a new baby just around the corner, we are going to be shuffling car seats once again and it will be time to vacuum the van seats and de-crumb the areas around the seats. I also like to organize the vehicle better when it comes time to do all of this. It is alot of work, but well worth it in the end. Recently, I was thinking about how damaging car seats can be to your vehicle. I was looking for a solution to the indentation of the seats and also something to protect the vehicle seats from spills and crumbs. While searching for a way to prevent this, I happened upon Munchkin's site on which I found an Auto Seat Protector. PERFECT!!! Just in case you have never heard of Munchkin before, it is a company that makes products for babies and children. They also make products to make a mommy's life easier...which I love! Munchkin was founded in 1991 by Steven B. Dunn and his goal was to get rid of the mundane and boring products for kids and make parenting more enjoyable and easier. Whenever I see Munchkin products in the store, I am always impressed with the colorful yet simple designs and products. Munchkin makes so much that is helpful and it is always extremely affordable compared to other brands, without sacrificing quality. This Auto Seat Protector was the exact solution that I was looking for when it came to my car seat indentations and messes in my van. Having one child in a car seat is a big enough mess...but having two children in car seats is double the mess. If I can eliminate the mess of one, that helps immensely! This Auto Seat Protector comes ready to install quickly and simply. The above picture is what the protector looks like when fully unfolded. It has a special flap that tucks into the seat back to keep it securely in place so it won't slide around. When installing into my vehicle, I simply set it on the seat and tucked in the securing flap. Storing this seat protector is a cinch as it folds up very compactly and easily. It is also simple to clean as all you do is wipe down with a damp cloth. That's it! Messy van no more and seat indentations are less! Fabulous!!!! The Click Lock Cups are one of the newest innovations of Munchkin and they are GREAT! I was sent three different cups from this line... Sippy Cup, Flip Straw Cup and the Insulated Big Kid Cup. All three of these cups are wonderful and as soon as my children saw them, they were VERY excited to try them. I gave my daughter the Insulated Big Kid Cup and my son was able to try the Sippy Cup (because it was a "boy" color). These cups are leak-proof and you can literally hear the "click" when you twist the caps closed. I love how they also fit nicely into our car seat cup holders too...I HATE having cups that fall out of the cup holders because their bases are too big. The Click Lock Cups vary in prices from $2.99 up to $7.99 depending on the style and size you want. The Auto Seat Protector retails for about $13.00 depending on where you buy it. So, in my opinion...Munchkin really has some great products! I am totally sold on the Auto Seat Protector and am going to get at least one more for the other car seat in my vehicle. I love how easy it is to install, clean and store. Better yet, I love how it works to protect my vehicle's upholstery. The Click Lock Cups are very innovative and my children love them. They too are affordable and easy to find in just about any retail store. The leak-proof design is perfect especially for my busy little ones. I would definitely and whole-heartedly recommend this company to all moms and dads out there who are looking to simplify their life with their children. Disclaimer: I received no monetary compensation for this post. I did receive free Munchkin products for review purposes. All quotes and stock photos are from the Munchkin website and email. Prize is being shipped by the sponsor. All thoughts and opinions are 100% mine. I'd like the Pink Paisley and the Dinosaur Click Lock Cups. I didn't find a listing for these individual cups, but this link has a video and a picture of all of the cups. Oops - I found this from your email, not Tightwad in Utah. 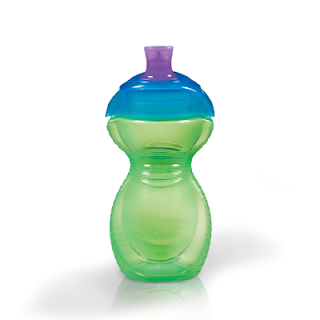 and the Mighty Grip Toddler Sports Bottle. I would probably get the mighty grip toddler sports bottle! Oh I would have to get the Sesame Street Elmo Click Lock Sippy Cup! Carter is so in love with Elmo right now he would go nuts over this. I would like the 9oz Click Lock™ Insulated Sippy Cup. I like the one with the whale and the dinosaur (?) on the moon with the flag. and 9oz Click Lock™ Sippy Cup, too. Id like Sesame Street Elmo and Sponge Bob! I would get two of the Backyardigans Insulated spill-proof cups so that each of my boys could have one but not fight over who gets which. Thank you for the giveaway!